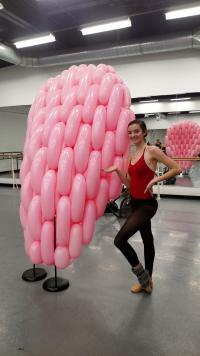 Rochester City Ballet brings Artistic Director David Palmer’s Green Eggs and Ham to the stage for your entire family. This witty and innovative retelling of the classic Dr. Seuss tale will be presented February 4-5 at Nazareth College Arts Center, with narration and sign language interpretation to help open the world of ballet to the youngest of new theatre goers. Joining the production to create scenery for a second ballet, “Follow the Rose,” and adding to the pre-show activities will be Airigami, the fine art of folding air. An autograph party with the cast will follow the production. Preshow activities will begin an hour before the show and are free to ticket holders. Activities will include a ballet demonstration, face painting, coloring, and activities with Airigami. “Green Eggs and Ham has inspired countless children to read and learn about language,” Artistic Director David Palmer said. He added his wife found the music for “Green Eggs & Ham” at a garage sale, sparking the conception of the ballet, first presented 2011 and it was her idea to include sign language in the production. She was pregnant with the couple’s second child and hoped to use sign language with the new baby. Green Eggs and Ham will be performed at Nazareth College Arts Center February 4th and 5th, with a special sensory-friendly show February 4th, designed to share a performing arts experience that is welcoming to all families with children with autism or with other. All tickets to the sensory-friendly show are free and families can sign up here. To purchase tickets: Order online at boxoffice.naz.edu or by calling 585-389-2170.